To receive Australian Government subsidies for providing aged care, an aged care service must be operated by an organisation that has been approved by the Australian Government. The approved Home Care Provider (“HCP”) has an allocation of “places” in respect of care recipients occupying those places in a service. HCP’s, uniquely offer “Managed Care”, which means the individual is formally assessed by independent government representatives (ACAT Assessments). They are then granted a care subsidy with the objective to assist people to remain living at home for as long as possible. And to enable consumers to have choice and flexibility in the way that care and support are provided at home. The HCP is the overriding responsible party for “authorisations”, and the management of care in the home. This includes care planning, budgeting, clinical governance, scheduling, supplier approval, and authorisation of payments from a care recipients government care subsidy. All invoices are automatically submitted to Capital Guardians for approval by the HCP. This can be done in bulk at statement level. 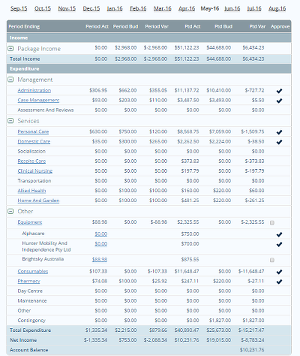 Or in the monthly report below, whereby a user can drill down into the invoice detail and approve invoices alongside their budget. Approval is a tick and submit. All vendors are paid all approved invoices every Friday.